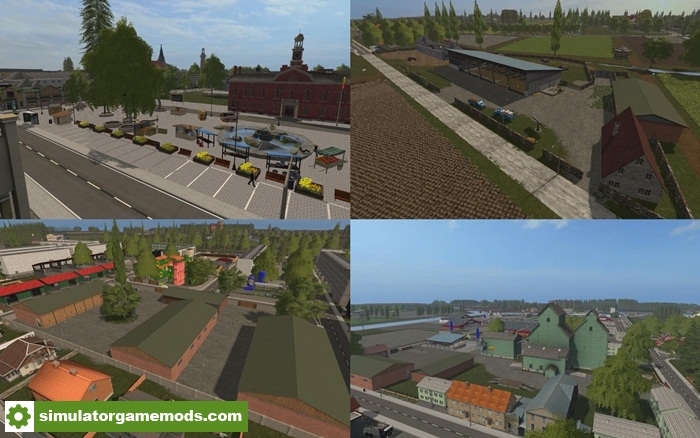 Genthin Map mod for FS17. this is my home town Genthin and the village Mützel, in Saxony Anhalt. I have them with the help of a map, my own knowledge, because of my long time I lived there and reconstructed sightings by driving down. The construction time of the map in the current state is about 11 months and it is my first project at all at the PC. In Genthin and the surrounding villages, about 15,000 people live. I have the city too large, the urban area Altenplatow to a small extent and the village Mützel completely reconstructed. You have three courtyards in the game. The main house (Uhlandhof), which is integrated into the residential area Uhlandstraße. Today, there are many green areas, since the residential blocks were gradually demolished and become. the Werderhof and the Feldhof. All farms have storage and seed / fertilizer facilities, as well as shelters, the main house still a gas station and a wash place. All animals and a feeding farm can be found in the village of Mützel. There is also a feed store at your disposal. In Genthin there are 47 fields between 0,6 and 12 ha area. Likewise you are available to me and the missions. There are no blocked productions on the map, but you have 16 areas with about 170 000m² available for everything. From the start, you have a big fleet, but you have to download it. (a download list is included) and below I also write down the downloads. In addition to these are animated gates and light, traffic and pedestrians and the gold nuggets. Since I still want to change some things or replace them, but these are currently not available there will be an update, when that will be so far I do not know.